I read this article and found it very interesting, thought it might be something for you. 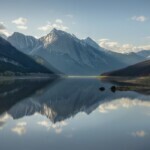 The article is called Best things to do in Jasper National Park – Ultimate guide to Canada and is located at https://capturetheatlas.com/top-things-to-do-in-jasper-canada/. 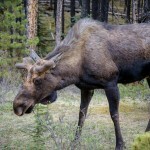 Visiting Jasper National Park (Alberta, Canada), is the best way to enjoy the wildlife of the Canadian Rockies. 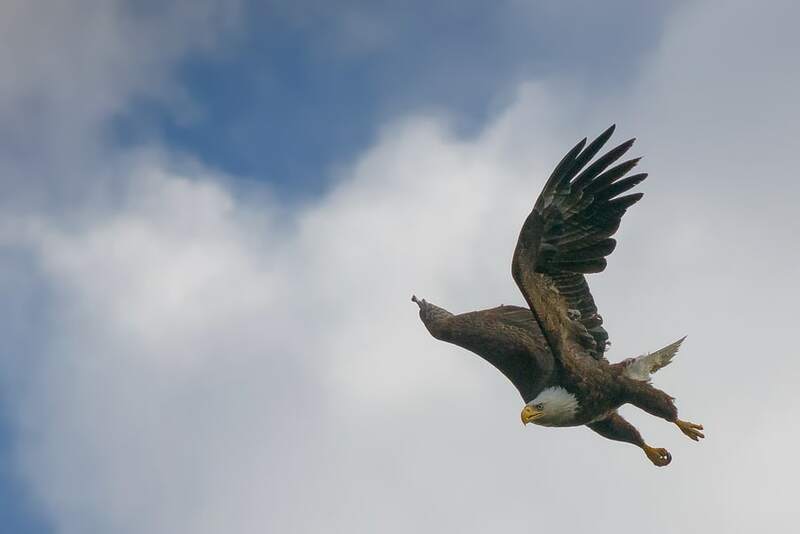 If an animal Safari is on your travel bucket list, know that North America has its own version! 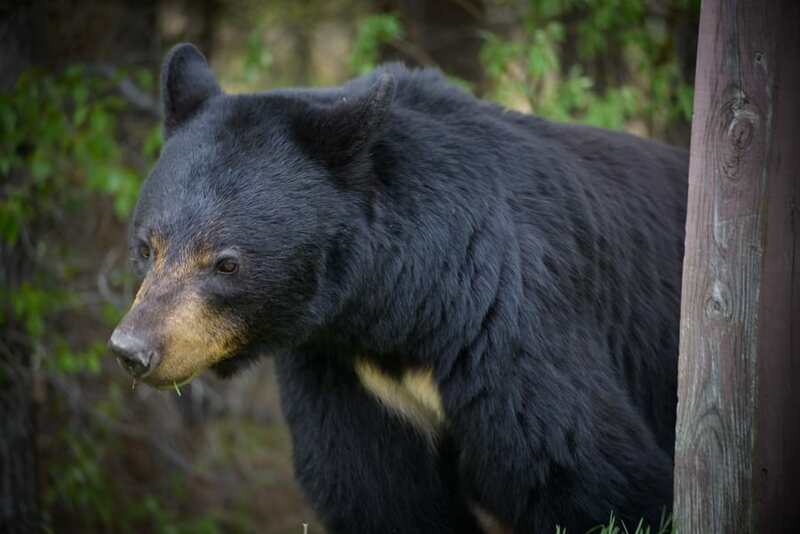 In Jasper National Park, you can find Grizzly bears, black bears, elks, beavers, caribou, wolves, moose, eagles, marmots, and more. 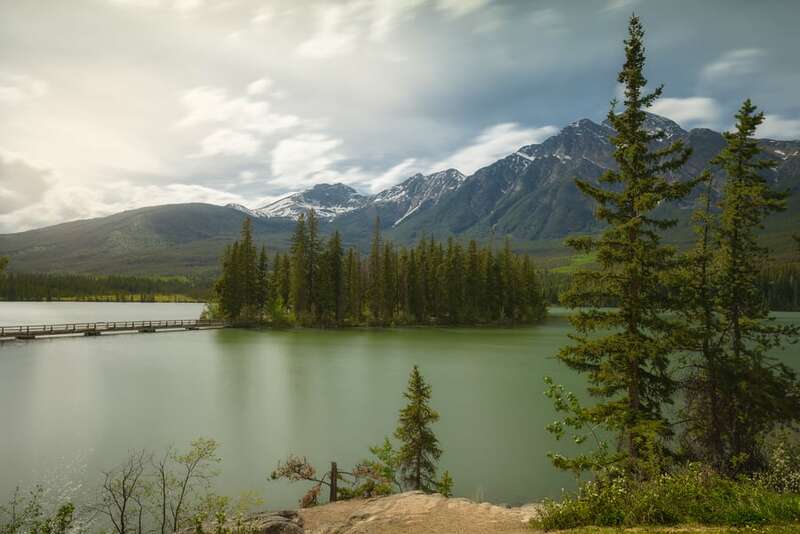 Also, you have many other things to see in Jasper National Park: lakes with incredible reflections, hot springs, glaciers, waterfalls… the list is countless. 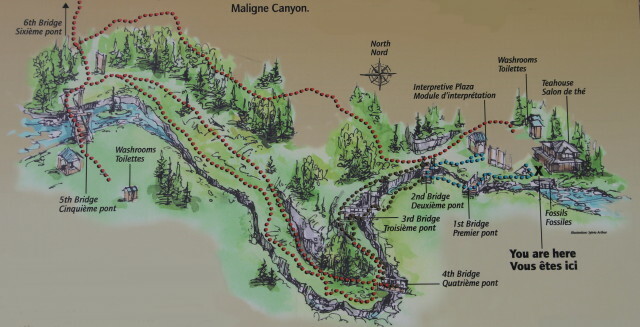 Maligne Canyon: Do not miss the Maligne Canyon hike where we find six bridges with incredible views of this canyon. Jasper SkyTram: Take the highest aerial tram in Canada to have unparalleled views of Jasper. 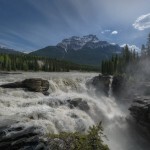 Athabasca Waterfalls: You can not miss a visit to the Athabasca waterfalls during your trip to Jasper. 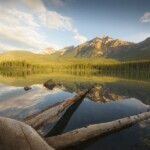 Maligne Lake: Without a doubt, it is the best place to have animal encounters in Jasper. Here you can find moose, bears, wolves and much more. 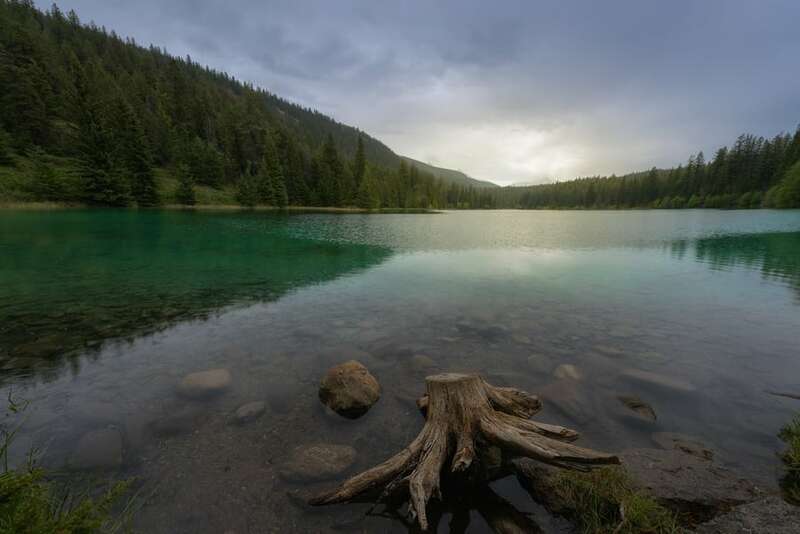 Medicine Lake: This magical lake that disappears during certain times of the year. A must-see in Jasper. Pyramid Lake: Under the Pyramid mountain, this lake surprised us for its tranquility. Do not hesitate to rent a kayak to explore it. 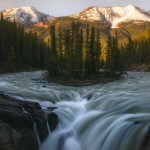 Sunwapta Fall: Visiting a waterfall where at the fall there is an island full of pine trees is something you have to do in Jasper. 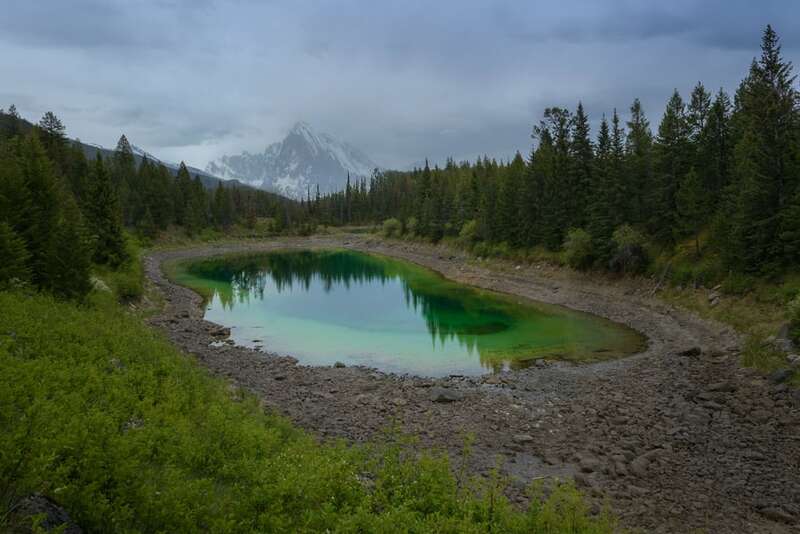 Beauvert Lake: This lake is one of the quietest areas of Jasper, although you have to be alert for the presence of grizzly bears. 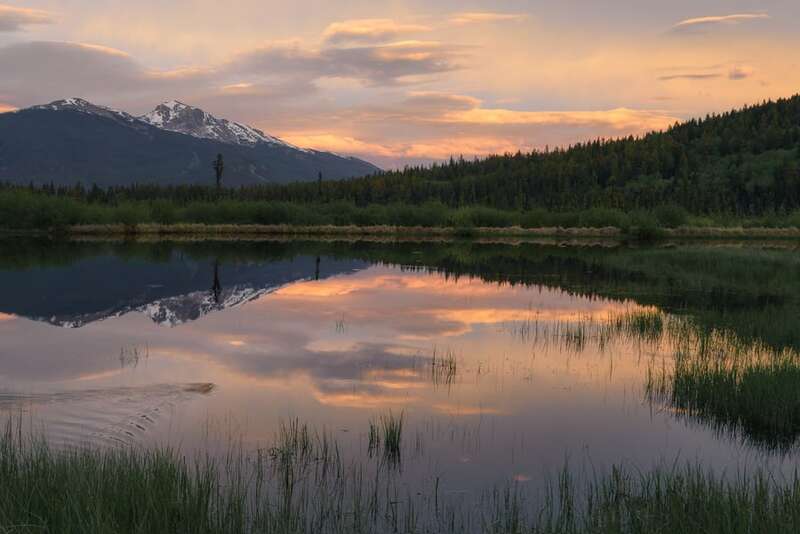 Here, you will find our Guide with the top things to do in Jasper. Jasper is the northernmost of the Canadian Rockies National Parks. It is located in Alberta and linked with Banff National Park via the Icefields Parkway, one of the most scenic roads in the world. 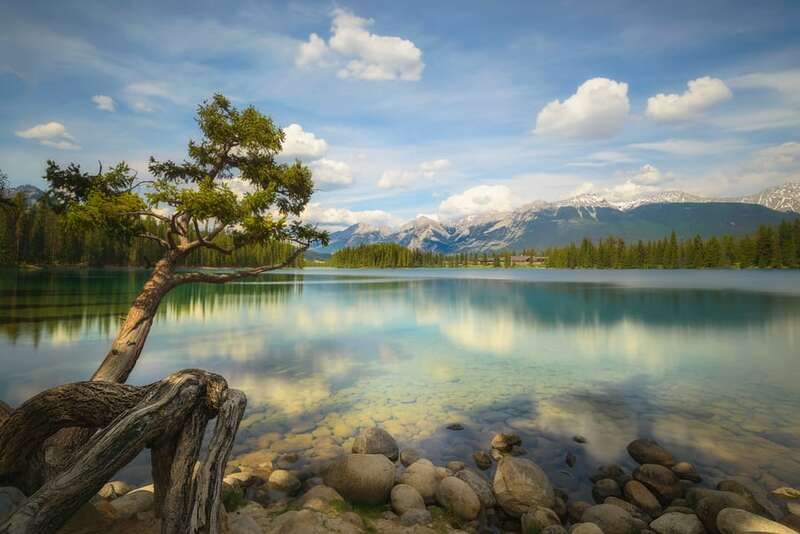 Due to its remoteness within the Canadian Rockies, the number of tourists that visit Jasper is lower than other parks such as Banff National Park or Yoho National Park. 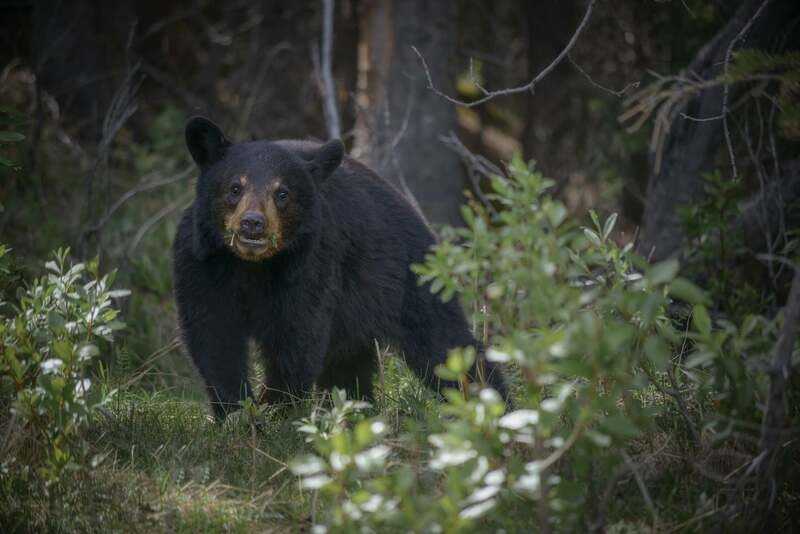 For this reason, wildlife spreads freely across the park. We can even find some endangered species here, such as the Caribou. 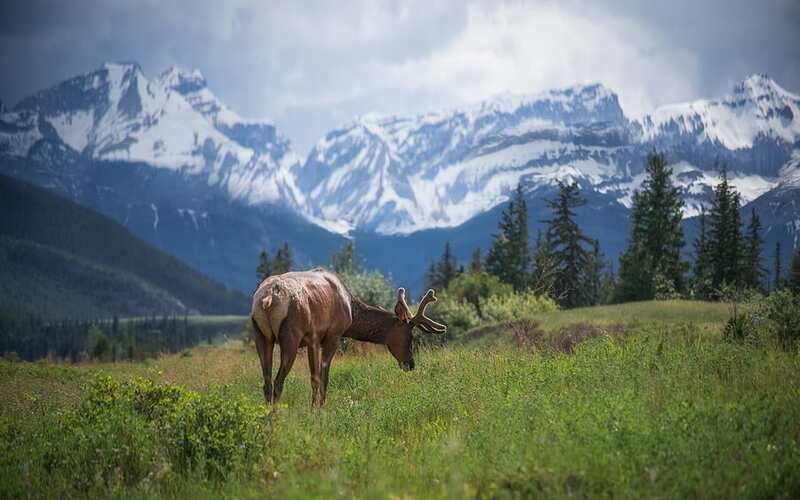 If you want to know more about wildlife do not miss our wildlife article with the list of animals you can find at the Canadian Rockies. 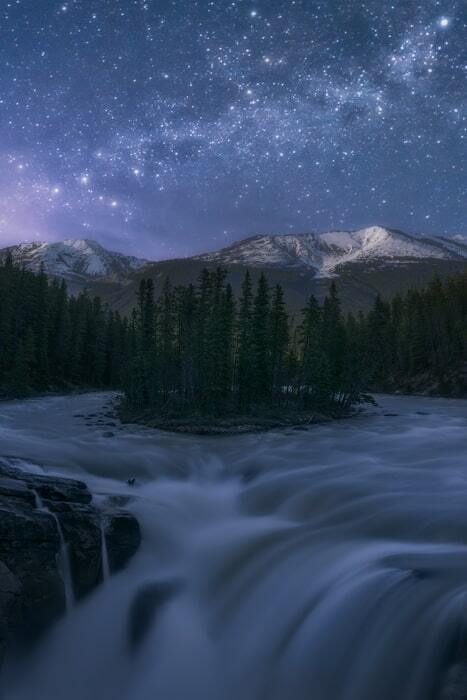 Jasper National Park is also a Dark-Sky Preserve. These areas are committed to protecting and preserving the night sky, thus reducing or eliminating light pollution of all forms. 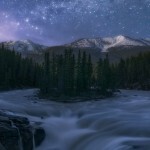 If you like star gazing or night photography, Jasper is your place. Also, the Jasper Dark Sky Festival is celebrated in October, where special workshops take place in addition to all the star-gazing activities throughout the year. 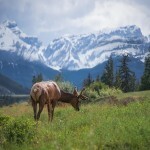 We spent four days in Jasper National Park during our 15-day Canadian Rockies trip. However, there are some multi-day trails that we missed and would like to hike next time we return. There are different ways to get to Jasper National Park, but I recommend renting a car, since you can’t reach many places via public transit. The best way to get to Jasper is through Banff National Park. Banff and Jasper National Parks are linked by the Icefields Parkway which is one of the most beautiful roads in the world. Driving across this road is simply one of the best experiences in the Canadian Rockies, so buckle up and enjoy some of the best landscapes in the world. The closest airport to Jasper is Calgary, which is closer to Banff, so I recommend to first go from Calgary to Banff and then take the Icefields Parkway to Jasper. Another option is to drive directly from Vancouver, which takes approximately 8 hours. 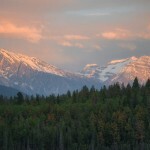 Along the way, you could go off to see the Wells Gray Provincial Park. Jasper is the largest Canadian Rockies National Park. However, most of it is inaccessible. That’s why nature and wildlife thrive significantly more here than other parks. Additionally, it is an ideal place for multi-day hikes away from any vestige of humanity. The landscapes that are found here varies – between cold glaciers in the south and hot springs in the north, we passed through waterfalls, lakes, valleys, mountains, and endless wildlife. 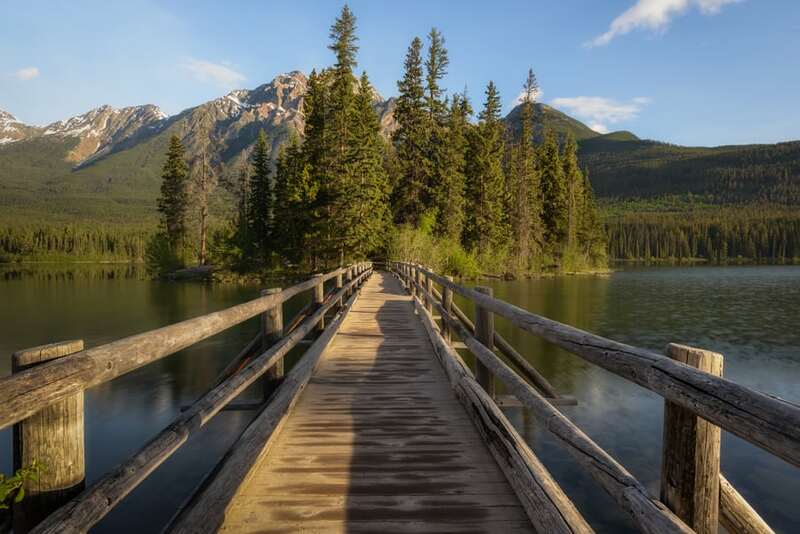 Throughout this travel guide, we will discover all the essential places you cannot miss in Jasper National Park. 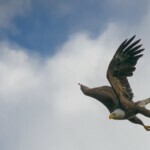 We will focus mainly on symbolic sites with wildlife. 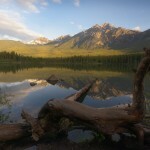 And of course, we will tell you about the best points of interest and excursions in Jasper National Park. Icefields Parkway. The most beautiful road in the world that we took from Banff National Park, with plenty of incredible waterfalls, glaciers, and lakes. Jasper. The visitor center, restaurants, and shops surrounded by dreamy lakes and wildlife. Maligne Road. You will feel like being in an animal reserve. Do not worry, they are all free and roaming wild. 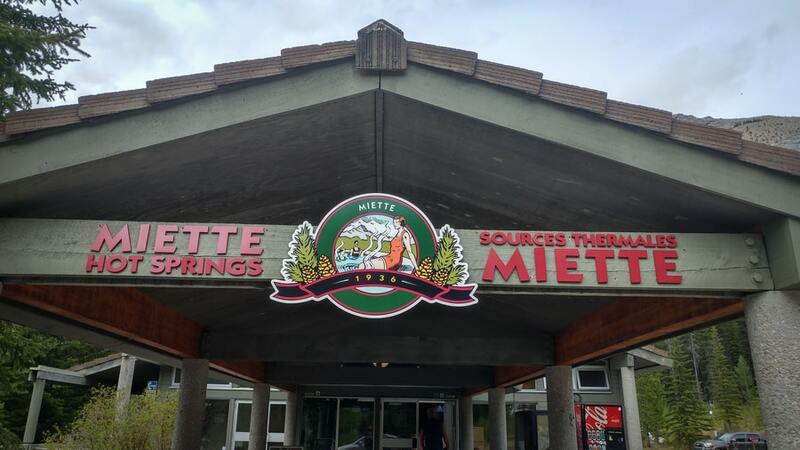 Miette Hot Springs. Relax in thermal waters surrounded by snow-capped mountains and wildlife. 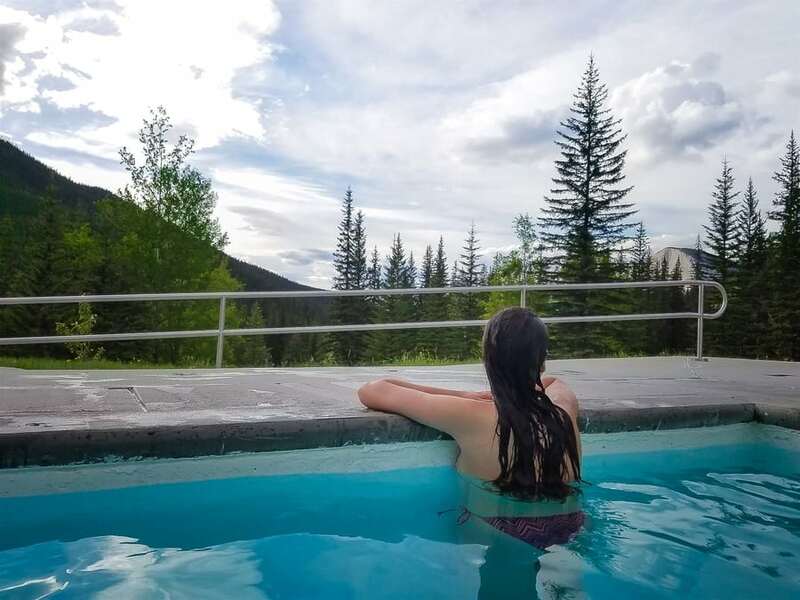 We will also talk about our accommodations (mostly campsites) in Jasper National Park as well as a list of the best hotels in Jasper. 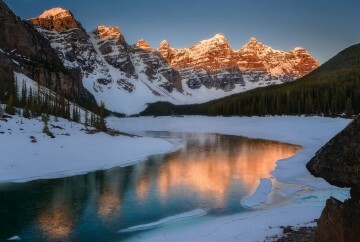 Finally, we will give you some tips, some of which are included in our Canadian Rockies Post. I recommend having a read before continuing with this article. The Icefields Parkway is considered the most beautiful road in the world. 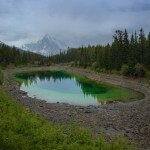 As we commented in the Banff National Park post, waterfalls, deep blue lakes, and glaciers can be found. It is also full of wildlife. 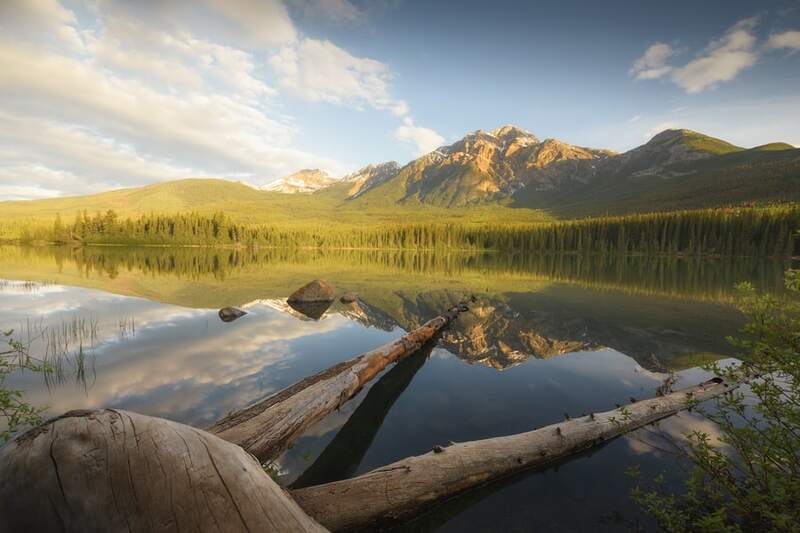 This 142-mile-long road links Banff National Park to Jasper National Park. Even though it sounds like a significant distance, points of interest are well distributed along the road. With mesmerizing views along the way, you won’t get bored of driving here. In this section, we will focus only on the stretch of Icefields Parkway relevant to Jasper National Park. 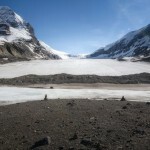 The Athabasca Glacier is one of the most accessible glaciers in the world. This multi-thousand years old ice tongue covers a 4 square miles area. The first is to park just below the ice tongue and hike up a little to observe the beginning of the glacier more closely. It is not recommended to walk on the glacier since there are cracks and sinkholes hidden by thin ice layers that have killed some tourists in the past. Another option is to hire a tour at the Columbia Icefields Discovery Center to visit the glacier by Ice Explorers. These 6-wheeled SUVs are designed to move around on the glacier. In addition, the guides will take you to an area where it is safe to walk on. We would also have access to the Glacier Skywalk, a glass platform hung on the edge of a cliff with incredible views. Tours operate from mid-April to mid-October. The price is 100 CAD or 90 CAD if purchased 48 hours in advance, and the tour takes approximately three hours for both attractions. 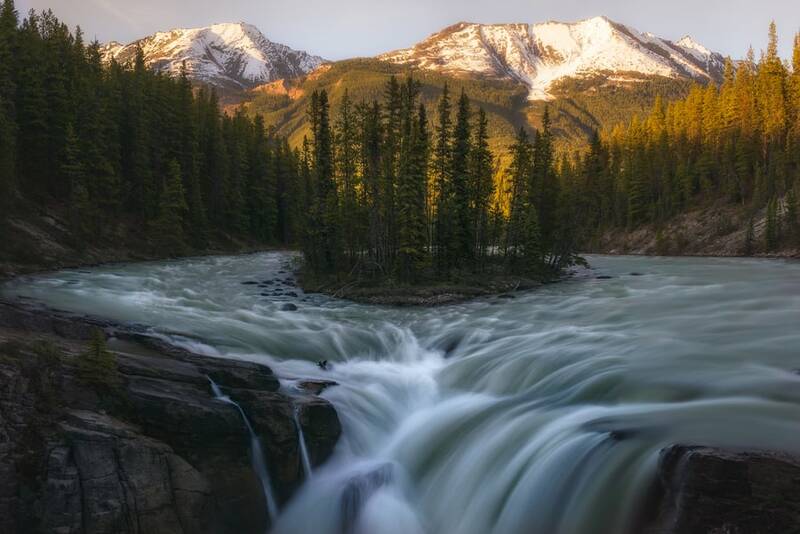 The Sunwapta Falls are without a doubt the most photogenic waterfalls we have ever seen. 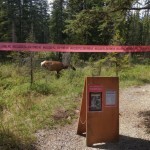 Also, they are very accessible since the path that takes you there is only 2000 feet away from the Icefields Parkway. This small waterfall is formed from the waters of the Athabasca Glacier, at only 62 feet tall. 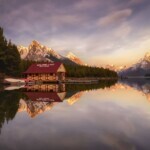 However, its main attraction is the small island just before the fall with a beautiful background of snowy mountains. For me, it is one of the essential things you have to see in Jasper. Many photographers for photos, especially during the night time, since there is no light pollution in the area. Sunwapta Falls Rocky Mountain Lodge is the only place where you can stay in nearby. We will talk about this hotel later in the accommodation section. 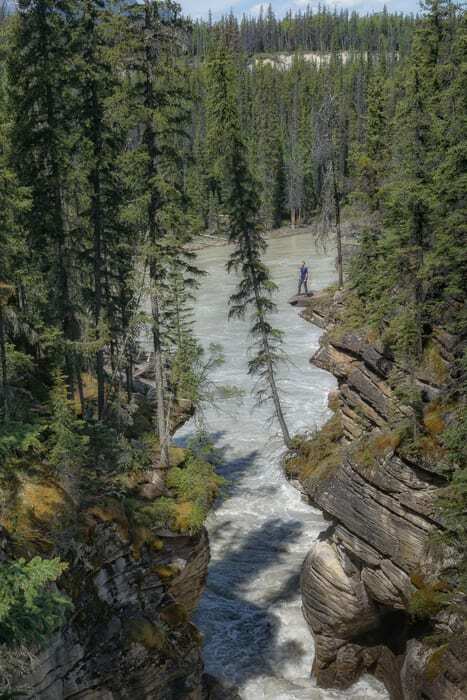 Visiting the Athabasca Falls is another one of the main attractions in Jasper National Park. 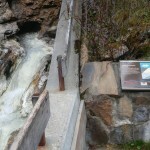 As we continue on the Icefields Parkway, we will arrive at the beginning of the path that takes us to these waterfalls. The primary interest of this place is the water carved limestone rock forms. Along the path, we can observe the waterfall from different perspectives. 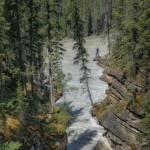 Several trails go to both sides of the Athabasca River. 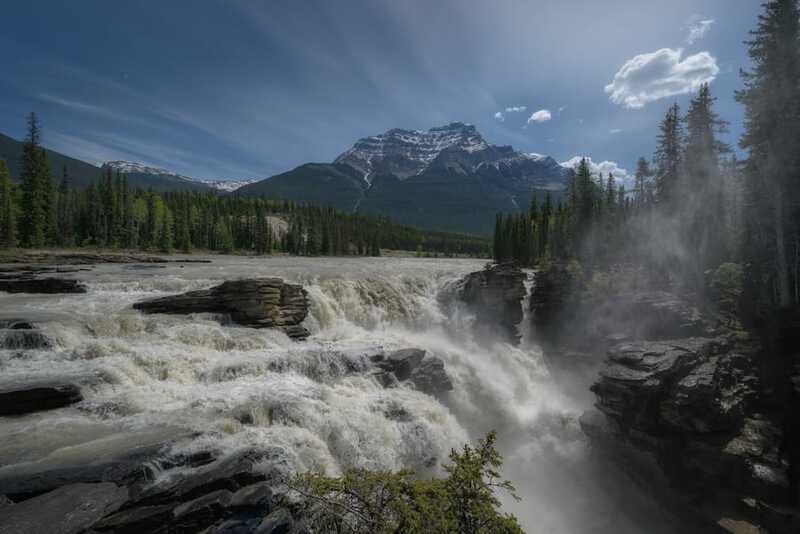 This waterfall, at 78 feet tall, carries plenty of water throughout the year – even at the end of summer, it is a mandatory stop for anyone who travels the Icefield Parkway. 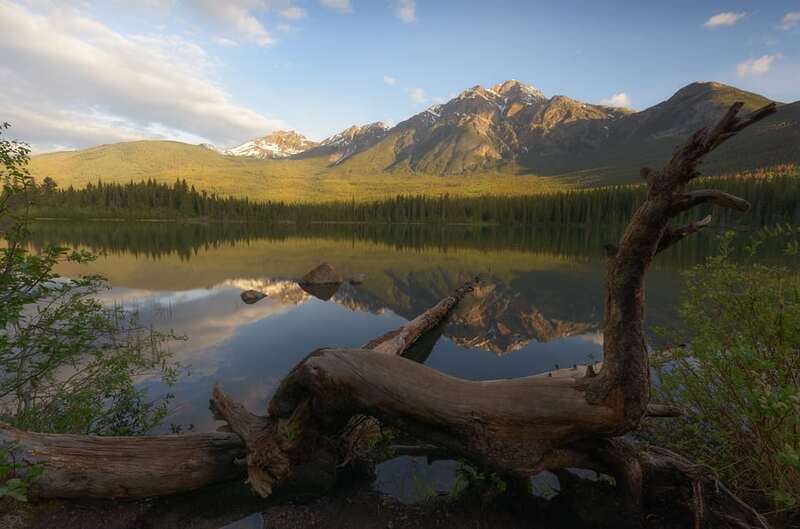 The Valley of the Five Lakes is located at the end of the Icefields Parkway, very close to the entrance of Jasper. For us, it was Jasper’s best hiking trail. Each of the lakes in this valley has a different hue, from jade to emerald. It is a perfect excursion to take it on a sunny day, as we will enjoy much more of its bright colors. The loop trail is 2.5 miles, which takes about two hours to hike. The terrain is not very steep despite constant ups and downs. In addition, wear closed toe shoes and powerful mosquito repellent if you come in the summer. The last of the five lakes was the one that we liked the most, with the small wooden pier. Jasper has everything you need. Restaurants, hotels, cafes, bars, ice cream shops, and even clothing and mountain equipment stores. 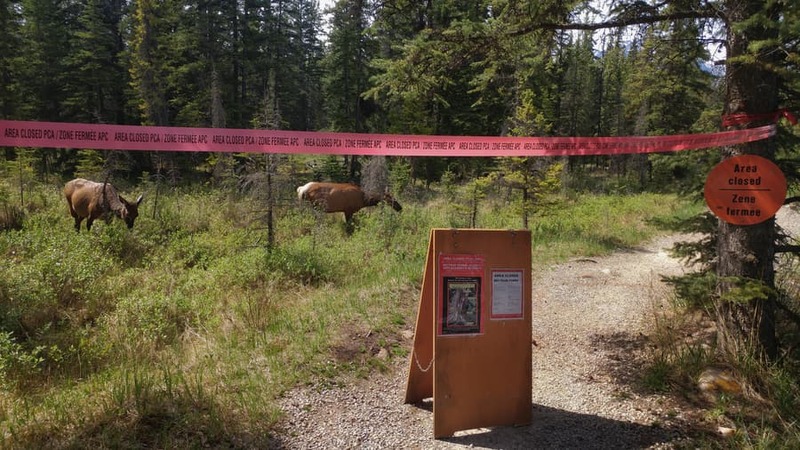 However, the most important of all is the Jasper National Park Information Centre, where you can get maps and guides you need for your hikes and excursions, including the Day Hiking Guide in Jasper National Park. You can also find it attached here. Before talking about the best things to do in Jasper, we would like to recommend two places we loved here. The first is the Scoops & Loops ice cream parlor, just in front of the information center. We had the best ice cream of our whole trip, and the best part is the names of the flavors which are perfect for the occasion, like Moose Tracks and Rocky Mountain Raspberry. 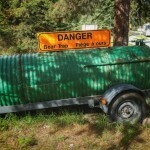 The second place I want to recommend is the Bear’s Paw Bakery, a craft bakery that became a ritual every morning that we spent in Jasper National Park. The smell of sugar and cinnamon overwhelms as soon as you walk through the door, and it is full of different natural options which make it even more difficult to decide. Cottonwood Slough is an area close to Jasper where several hiking routes begin. You can leave your car in the parking lot labeled as P4 in this guide. Here, we will find several wetlands – and with good luck, it is possible to see moose, bears, deer, and even beavers at sunset. We came here one evening, apart from seeing these elusive animals (Can you see the beaver in the photograph above? 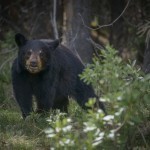 ), we also saw a black bear close to the lake. He ran away as soon as we approached the lake. 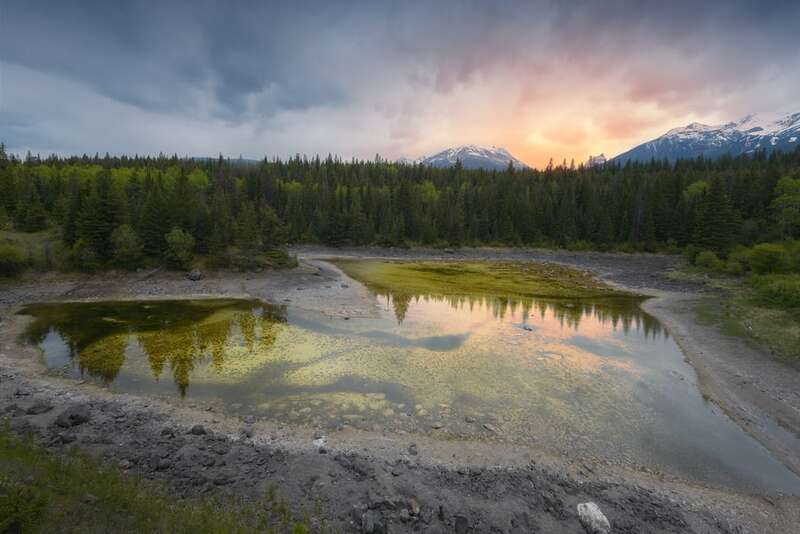 We think this is a perfect place to enjoy the sunset, although it is more than advisable to bring a good mosquito spray (and bear spray too). 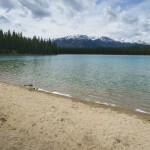 On the same road, the Pyramid Park Road, we can find the first big lake in Jasper, Patricia Lake. 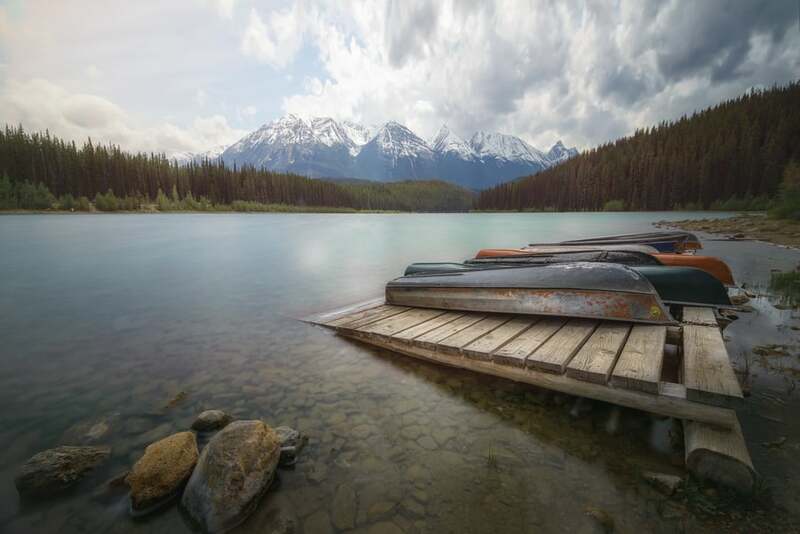 This lake has a shoreline similar to a beach, where canoe rentals are offered, making it an especially popular destination during the summer months. 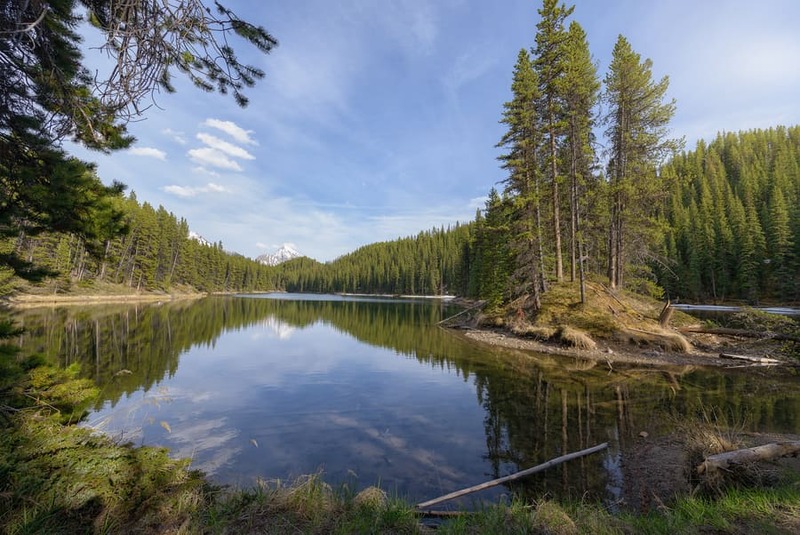 We can find the Patricia Lake Bungalows around the lake where a path connects them with the Cottonwood Slough. One of the peculiarities of this lake is the remains of the Habakuk Project, where the British investigated ice-based composite materials to manufacture unsinkable aircraft during the Second World War. To visit these remains, you have to request for a special diving permit. Continuing along the same road, we will soon arrive at Pyramid Lake. 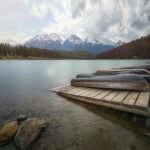 This lake is located at the foot of the Pyramid Mountain which is a point of interest that you have to see in Jasper. This lake is also famous for Pyramid Island, a small island within the lake which can be reached by crossing a wooden bridge. There are benches and a picnic area once you get there. 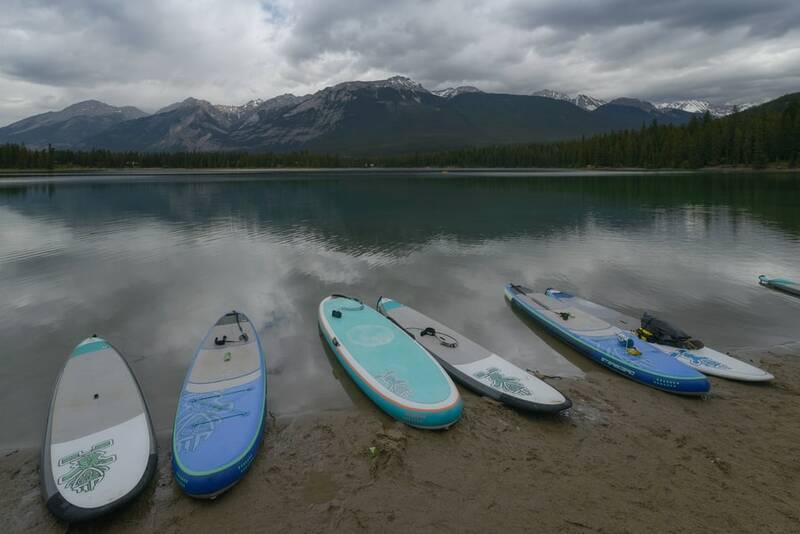 Like Patricia Lake, this lake is perfect for kayaking or enjoying a day at the beach. Also on its shore is the Pyramid Lake Resort. 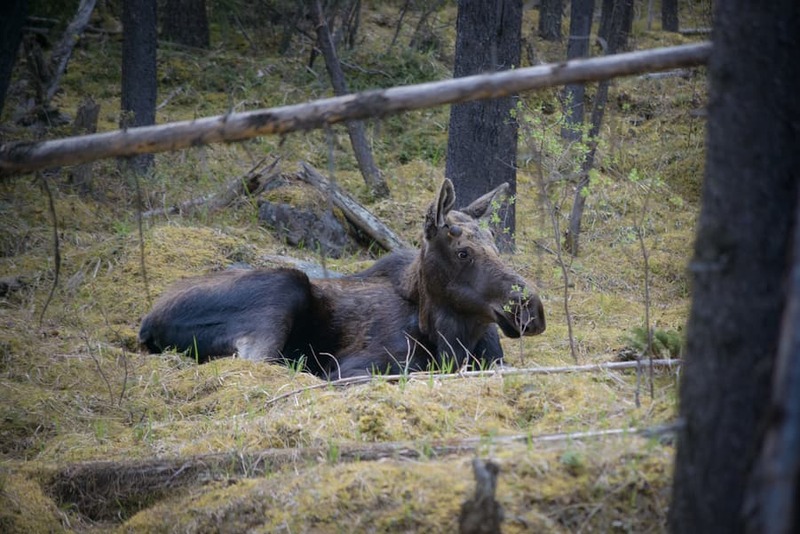 In this area, it is quite common to find moose, bears, and all kinds of wildlife at dawn and dusk. Pyramid Lake is a must see in Jasper National Park. 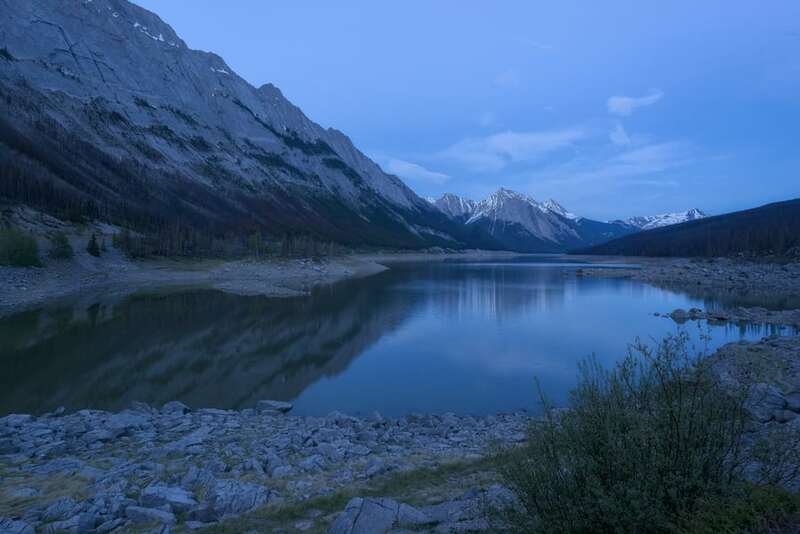 Moving from the west to the east side of Jasper, we will find a series of lakes that were once a single lake that covered the entire Athabasca Valley at the end of the ice age. 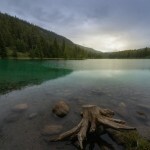 The first of the so-called Kettle Lakes is a beautiful bright green lake called Beauvert Lake. There are several trails around, but all were closed in May when we visited due to Elk Calving Season. At this time, female deer are very dangerous as they are always on alert due to the presence of Grizzly bears that prey on the young deer. Anette Lake and Edith Lake also belong to the Kettle Lakes. These lakes receive their water through an extensive network of underground springs. They are located very close to each other with a picnic area and parking between them. Both of them have a bluish green color, perfect for spending a day canoeing or kayaking. 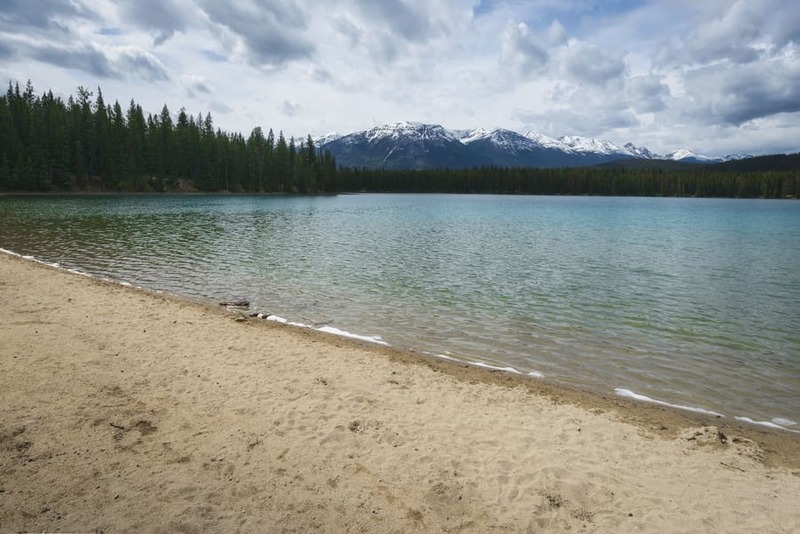 Also, Annette Lake has a beach that is very popular during the summer months. By the beach, we find the fenced Ochre Lake, a lagoon full of quick sand. Entering this lagoon is prohibited. The Maligne Road goes from Jasper to Maligne Lake. It is the only way to get to this lake, and across its 26 miles, we can find canyons, lakes, and plenty of wildlife. If you like animals, it is very likely that you will travel this road more than once. To be exact, we went through it every day we spent in Jasper (I would say more than once a day). The best time to do it is at sunrise and sunset. Keep in mind that you will not find gas stations or shops here, so be prepared with everything you need, including food, water, and gasoline. 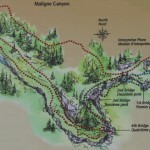 Maligne Canyon is at the beginning of the road. 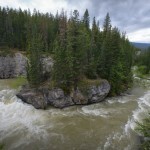 This canyon is one of the most exciting attractions in Maligne Road and Jasper National Park. The complete tour is 2.4 miles, and you will pass through six bridges with stunning views of the canyon. There are two possibilities, either park your car at the tea house that is next to the first bridge or park your car in the parking lot at the sixth bridge. The first five bridges are pretty close to each other. Therefore, many people walk from the tea house to these five bridges and then drive to the last one. Also, the most exciting part of the canyon is the area around the first bridges, since the canyon is much narrower here. 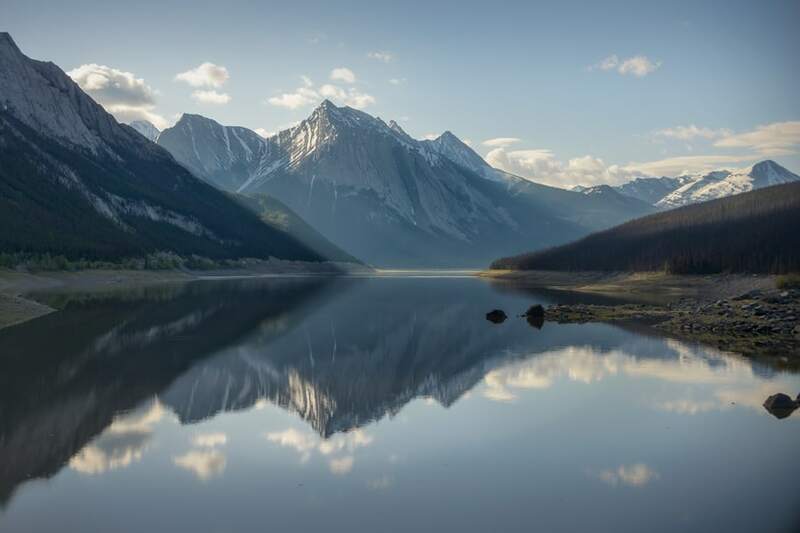 Medicine Lake is probably the most mysterious lake in Canada as this lake disappears entirely during some months of the year. 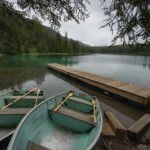 The Maligne River flows from Maligne Lake to Medicine Lake. 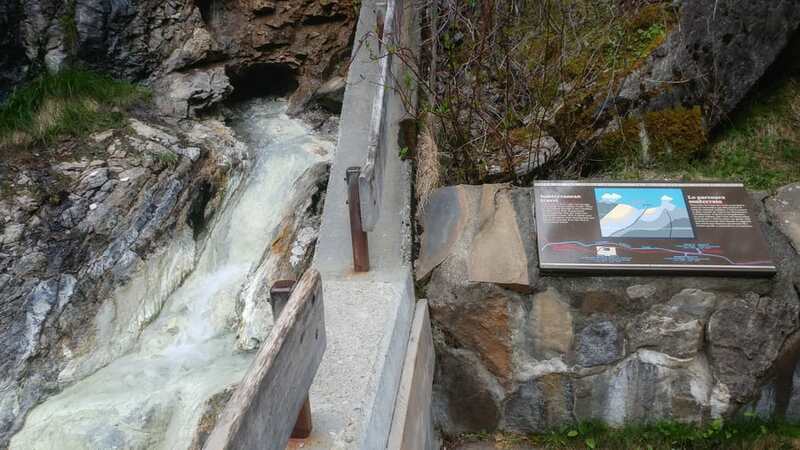 At the bottom of Medicine Lake is an underground drainage system in the limestone, where the water vanishes and then later appear in the Maligne Canyon. 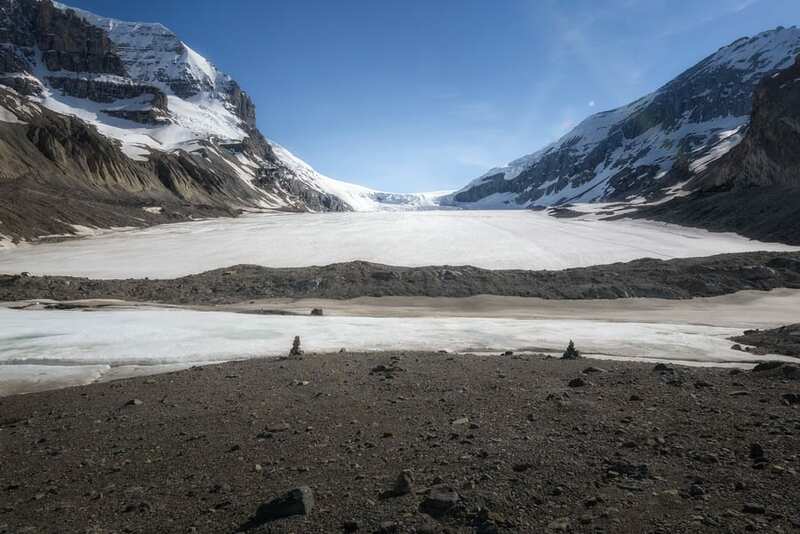 During spring, melting of the glaciers means that the lake is receiving more water than it is draining, so we will find the lake full at this time. However, in autumn and winter, the amount of water it receives is lower than its drainage rate, which then transforms the lake it into a marsh. 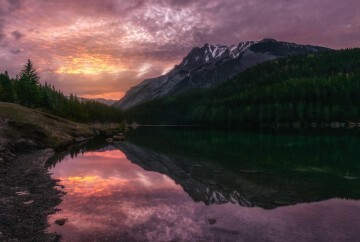 This unique seasonal phenomenon led the aboriginal tribes to believe that this lake had magical and healing properties, and decided to call it “Medicine Lake”. Due to a recent fire in 2015, the entire area surrounding the lake is devastated. It will break your heart to see thousands of rows of pine trees wholly burnt out. It was an ecological catastrophe since the vicinity of the lake is home to many species. 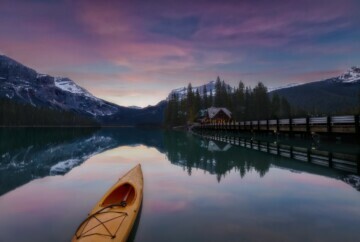 Undoubtedly, Maligne Lake is the most fantastic lake you must see in Jasper National Park. It doesn’t matter how many pictures you see – you need to enjoy the intense blue color that shines during summertime with your own eyes. The northern end of the lake is accessible by car, and the rest of its 14 miles can be explored by boat or canoe. One of the most interesting points to visit is the Spirit Island, which is 8 miles away. This tiny island lures many visiting photographers. However, we did not have the opportunity to see it mainly due to time constraints. Our boat ride here was expensive (CAD 74 or CAD 67 if you pay in advance) and not as fun as we had planned. Our plan is to visit it by canoe, for which we would need at least three days. 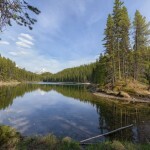 The lake has three backcountry camping areas for those who are motivated to go by canoe or kayak. You can book them from here. 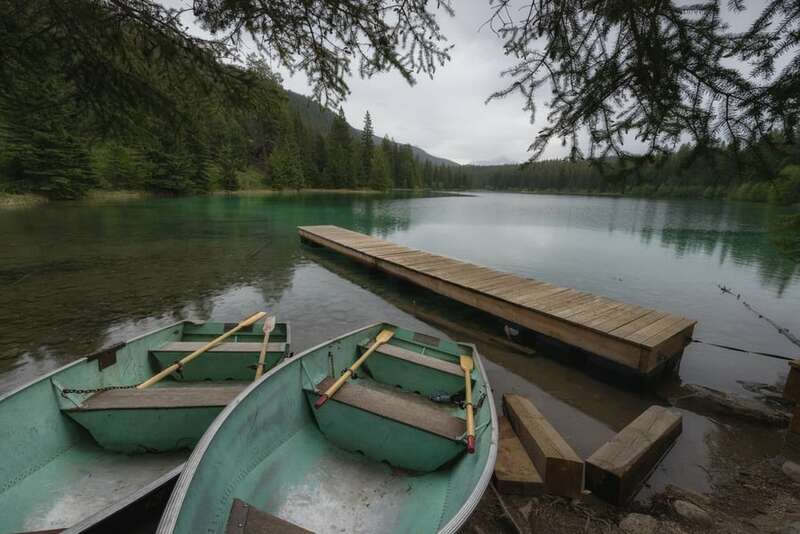 Also, the great thing about exploring Maligne Lake by canoe is being able to go beyond Spirit Island, where tourists are few and wildlife is bountiful. 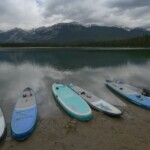 Pure Outdoors is one of the companies that offer kayak rentals in Maligne Lake. The price is 90 CAD for individual kayaks and 120 CAD for tandem kayaks on the first day. On your second day, you get a 25% discount on your rental. Remember to book in advance so they can get the kayaks to the lake, as they do not keep them there. 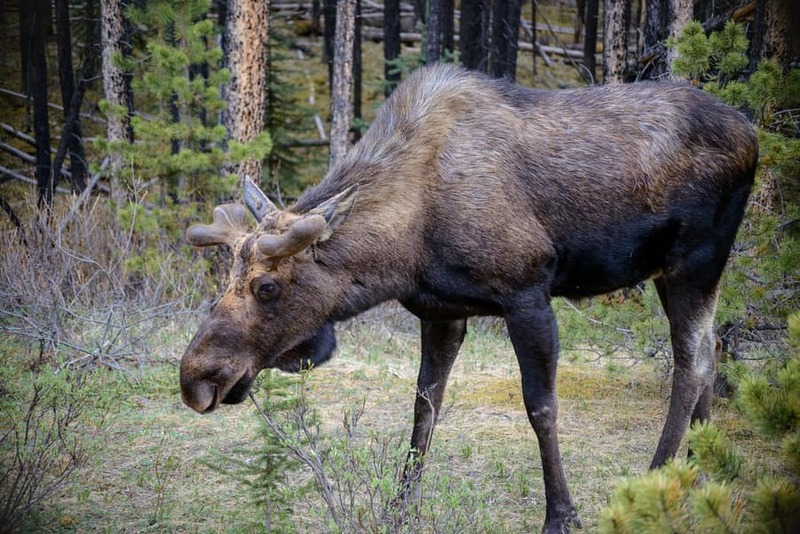 In our attempt to see moose, we decided to hike a small route that starts from Maligne Lake which is known as Moose Lake Loop. This area is supposed to be frequented by moose, especially toward the end of the route, where they go to the lake to drink and cool off. We did not see any moose, but we liked the trail. It was also the only one we could hike in this area since the rest of the trails that begin from Maligne Lake were full of ice and snow. 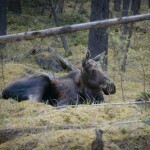 It took us an hour to hike the 1.25 miles trail, and luckily, we saw moose on the main road of Maligne Road later on. Taking Yellowhead Highway 16 from Jasper, we arrive at one of the park’s best landmarks. 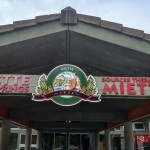 The Miette Hot Springs, located in the unique setting of Fiddle Valley. To get there, you must cross the small town of Pocahontas through a wild and remote road. 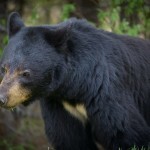 We were lucky to see several black bears here. The facilities are quite small, and despite being the beginning of the season, it was full of people. However, the views from here are not exciting. The price is very low, just 6 CAD per person, and they are open from May to October. It is also exciting to visit where the first pools were, about a half a mile away, and also to see the original spring where the water runs at 129ºF. Once the water is in the pools, it is cooled to a comfortable 104ºF. As we discussed in the Canadian Rockies article, we prefer to camp rather than staying at a hotel. However, we stayed at the Sunwapta Falls Rocky Mountain Lodge one of the nights since it was the only lodging in this area of the Icefields Parkway. 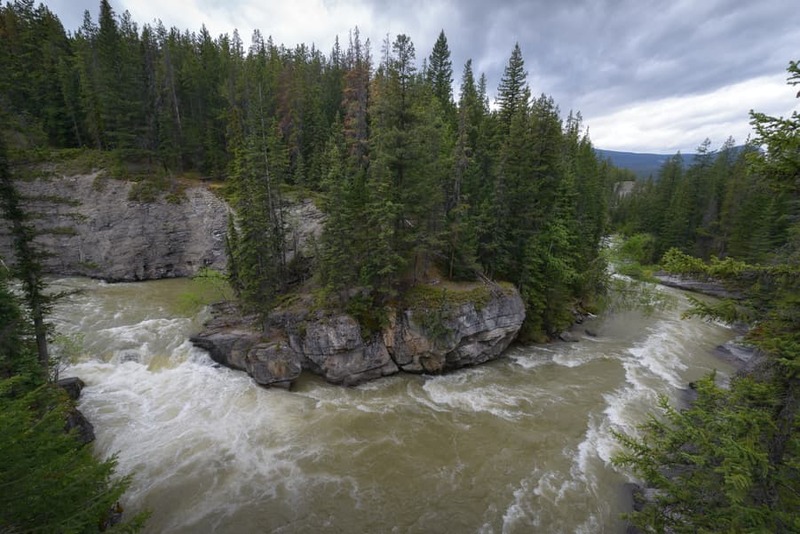 In addition, as we commented at the beginning of this article, Jasper National Park is quite remote, and much of this area can only be entered on foot that can last even weeks. 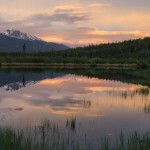 If you like nature and have enough time, do not miss the backcountry campsites. We wanted to enjoy a night photography session at Sunwapta Falls and the best way to do it was to stay in these cabins that are just a quarter of a mile from the falls. Don’t expect a Wi-Fi connection in such a remote place. It is scarce and does not work well at all. However, you will not miss it because you will be in a beautiful environment. Our room was $173 with a fireplace next to the bed. What we liked most about Sunwapta Falls Rocky Mountain Lodge is a board placed in the reception where guests can report their wildlife spotting. This lets guests help each other find wolves, moose, bears, etc. It was very helpful for us, as knowing where animals have been seen in the past few days of our visit greatly increased the chances of our own success. 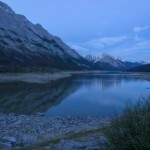 The Wapiti Campground lies within the edge of the Athabasca River. 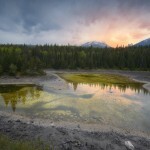 It is located on the Icefields Parkway but very close to Jasper. We stayed at this campsite during the three days that we spent in Jasper and surroundings. It is quite a large camp, and I think that it would be full in the high season since it was already quite crowded in May. You can book a spot here. 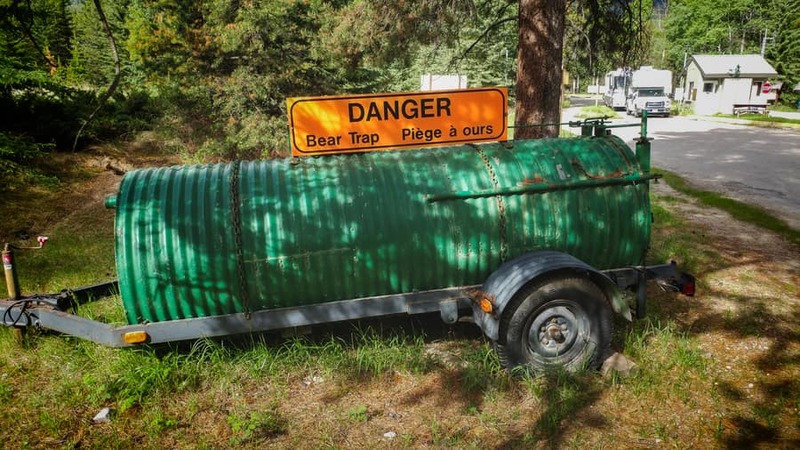 The campsite has bathrooms with showers, wood to make bonfires, and bear traps, so we assume that bears have been seen here more than once. We paid $ 22 per night. As we mentioned, most of the area is not accessible by road in Jasper National Park, which results in a lot of remote trails enticing the most adventurous. Here is a list of off-road trails that you may be interested in, classified by the number of days it takes to hike them. 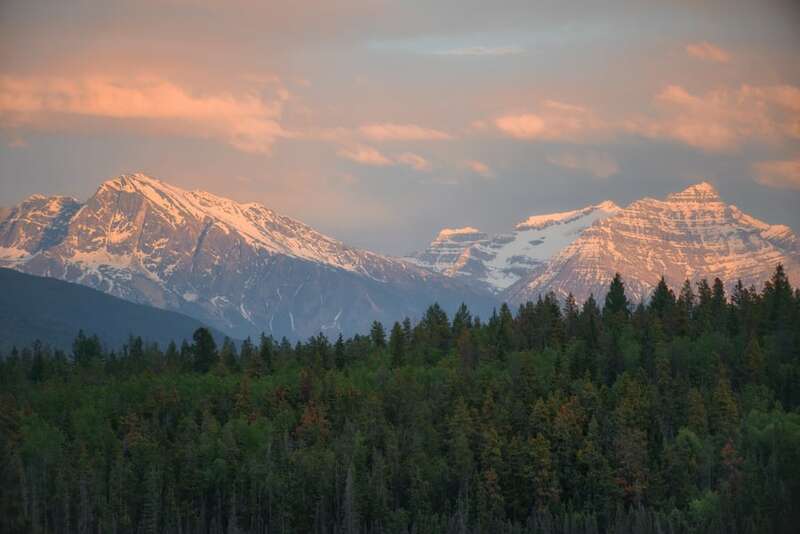 Also, you will find all the backcountry campsites in the park here, so that you can plan where to sleep on your trip to the wildest Rockies. We provided some good tips in the Canadian Rockies Mountain article, and if you have not read yet, I strongly recommend doing so. In that post, we talked about visas, currency, park entrance fee, and the things you need to bring, etc. Here we will focus on useful tips for Jasper. The best time to visit Jasper is from May to October. However, if you travel in the spring, temperatures are considerably higher here than in Banff National Park or Yoho National Park. 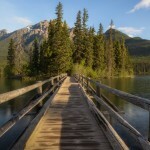 I recommend heading to Jasper first when visiting these three parks in one trip. The lakes here thaw before the other parks. Also, fewer tourists at this time increased our chances to see wildlife. We spent three days here, and the truth is that we would have stayed a few more days, especially so that we could kayak Maligne Lake. 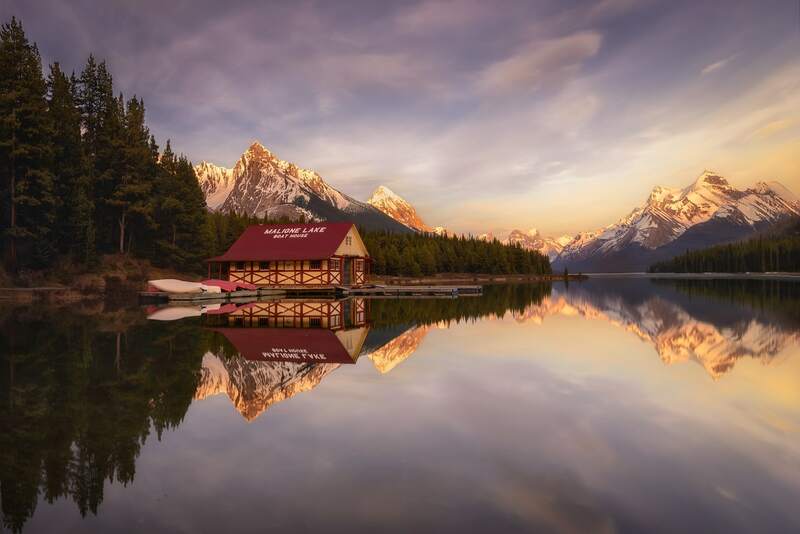 If you travel for 15 days to visit the Canadian Rockies, this is the time frame you can plan for this park. In my opinion, it takes at least a week to visit all the exciting places in Jasper, including a canoe tour to Spirit Island. To finish this guide of things to do in Jasper, you can find a map with all the places of interest below. HOPE TO SEE YOU IN OUR NEXT ARTICLE AND DO NOT HESITATE TO LEAVE US A COMMENT IF YOU NEED MORE INFORMATION ABOUT JASPER!